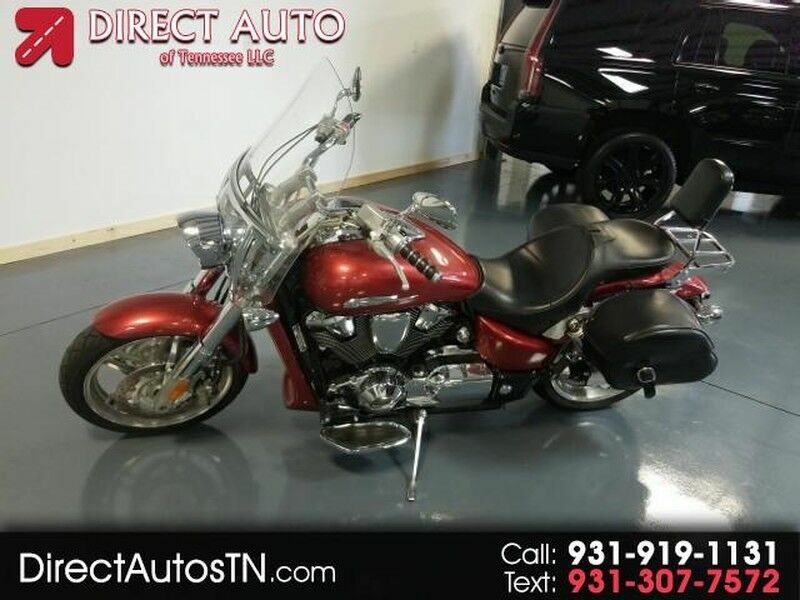 Visit Direct Auto of Tennessee online at www.directautostn.com to see more pictures of this vehicle or call us at 931-919-1131 today to schedule your test drive! The VTX1800F is available in three distinctive build variations: Spec 1, 2 and 3. Bold sport-custom performance-cruiser styling. Bobbed-style front steel fender with straight-cut rear steel fender complement the drag-racing look. Low 27.6-inch two-piece gunfighter-style seat features a removable passenger section for an enhanced custom look. Semi-swept, high-rise, aluminum handlebar mounts provide a comfortable, upright riding position. Handsome chromed two-into-two staggered exhaust system features five-bolt muffler tips and a deep exhaust note. Streamlined headlight features a smaller hooded lens for a unique minimalist look. Aggressive 10-spoke racing-type cast wheels feature a low-profile 130/70R-18 radial front tire with an aggressive 180/55R-18 radial rear tire to put the engines awesome power to the ground and enhance the overall performance and custom look. Large, handsomely finished, flangeless 4.8-gallon gas tank features pinstripe-quality VTX decal badging. Custom-design wedge-shape mirrors. Custom-style recessed LED tail- and brakelight. Billet-style rear fender rails feature a slotted surface treatment with hairline brushed finish for a unique custom look. Bullet-style turn signals feature chrome visors, clear lenses and amber flasher bulbs. Tank-mounted digital LCD instrumentation includes a speedometer, bar-graph tachometer, odometer, A/B tripmeters and a clock. Electronic control unit (ECU) closed-loop emissions system utilizes an air-injection system and three-way exhaust catalyzer to simultaneously reduce emissions of hydrocarbons carbon monoxide and oxides of nitrogen. California model exceeds CARB 2008 emissions standards. California version meets current CARB standards and may differ slightly due to emissions equipment. Convenient push-to-cancel turn signal switch. Five-speed transmission with carefully selected gear ratios for relaxed cruising and exciting roll-on performance. Purchase of a new previously unregistered Honda unit by an individual retail user in the United States qualifies the owner for a one-year complimentary membership in the Honda Riders Club of America(R) (HRCA(R)). Benefits include roadside assistance online access to the Honda Common Service Manual six issues of the bimonthly Honda Red Rider(TM) magazine travel discounts trip routing and MSF reimbursement plus access to the HRCA Web site. For details on the HRCA dealers should call (310) 783-3958 8:30 a.m. to 5 p.m. Pacific Time. Transferable one-year unlimited-mileage warranty; extended coverage available with a Honda Protection Plan.